Rammesh is an accomplished and versatile leader that has over 20 years of experience in the IT Industry and has been with Cisco for ~17 years performing multiple roles in the IT Organization. Rammesh manages the Service Support Management System in Cisco IT. In this role he manages the eco-system built using ServiceNow and other Collaboration Products like Webex Teams. He also drives the digital support transformation moving traditional support to new age support model using Bots, Virtual Agents, AI/ML and others. 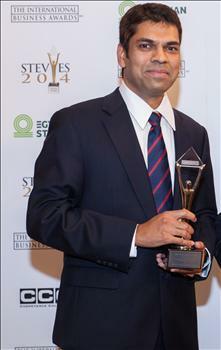 Rammesh is the winner of the much-coveted award, “IT Champion” both as a team and as an individual. He also won the “Manager of the Year” award in IT. Within his Org he won the highest, Galaxy Award. He also won Stevie Award for the Best Mobile App and represented his org to receive Silver and Bronze Awards. Rammesh is known for his adaptive, collaborative and inclusive leadership. As a leader, he helps see the big picture and connect the dots. He is a great collaborator and believes in constant Innovation with Operational Excellence to improve the Productivity, Efficiency and Speed of the organization and User Experience at the optimal cost. He is a Highly motivated and passionate leader with global mindset and often referred by his colleagues as contagiously enthusiastic. Rammesh did his Bachelors in Mechanical Engineering from the premier National Institute of Technology, Tiruchirappalli, INDIA in 1993. He also got Associate Certificate in Project Management from George Washington University. He is certified in Data Science for Leaders from NC State University.